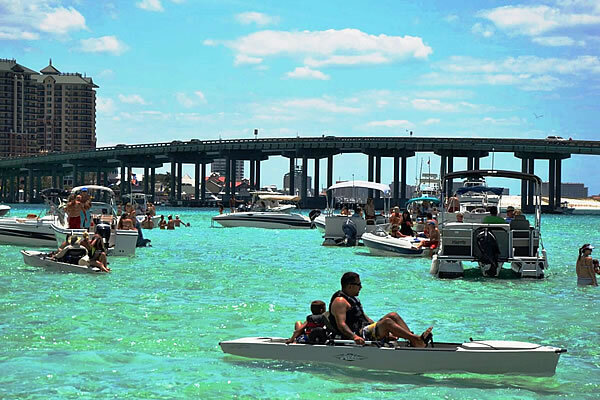 "Crab Island Cruise. We had the best time on this 3 hour trip to Crab Island. We have been visiting Destin every summer for 7 years. Every year my children have asked to go to Crab Island but we do not own a boat and I was not confident enough to try it on a kayak. This year I found this Destin cruise and we booked our tickets about a week in advance. We had a great time and will do it again!" "Better than renting a boat. 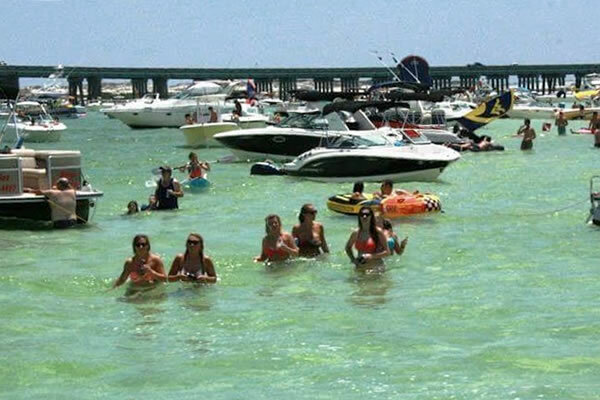 At these prices, this is your best way to enjoy Crab Island. 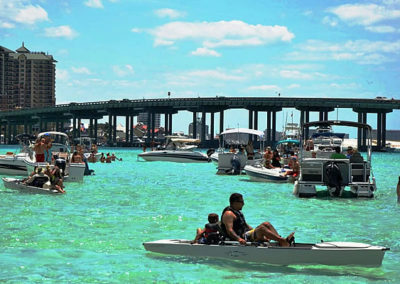 They offer a morning and an afternoon trip, both which give you about 2 hours at Crab Island. That’s plenty of time to enjoy it. Seriously - there are people swimming everywhere alongside and in-between the boats. Save yourself the liability and let these professionals deal with the risk. When you get there, the inflatable obstacle course is great for the kids. Our kids (ages 4,5, and 12) all enjoyed it. Little ones needed a bit of help but it kept us busy for a solid hour." "Haven't had this much fun in years! Everything was great about the cruise. Crab Island is awesome! You can just float around, play volleyball, etc. The crew was wonderful -- Capt Larry and the first mate were entertaining and helpful, as well as experienced and knowledgeable about the area. They made sure everyone had a good time, helped with pictures and guarded our stuff on the boat. We highly recommend it to everyone!" There is a 48 hour cancellation policy. You must call prior to 5 p.m. (central time) 2 days prior to your cruise date. Missing the cruise for any reason will result in the credit card being charged for the full amount. Double check that you have the correct location and address. Please allow ample time for parking and traffic during the busy summer season. 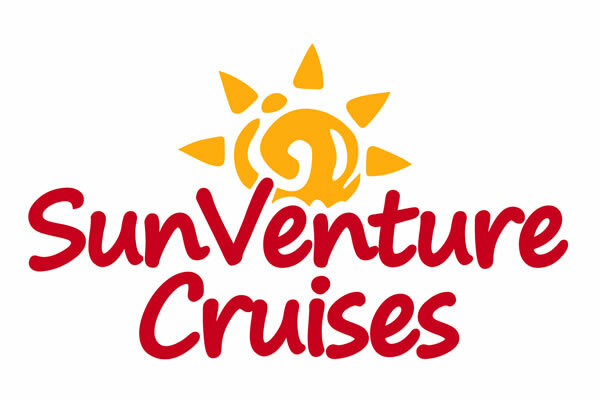 Check-in 30 minutes prior to your cruise time at the SunVenture kiosk at your location. Enjoy an open air catamaran offering the most up close and personal views of the water. All seats offer great views in a relaxed, personal setting. Our captains always enjoy some extra help – kid captains are always welcome! After the short ride through the Emerald Coast waters, our captains will drop anchor in the shallow, crystal clear waters of Crab Island. Our captain and deckhand will assist you on and off of the vessel. Please wait for their assistance before boarding. Our boat and captain stays with you during the entire excursion. The rest of the time is yours to partake in the activities or just relax. You can choose to snorkel, listen to live music on a floating stage, have lunch at one of the floating food vendors, or chill on a float. There are live music concerts on certain weekends in the summer on a floating stage. Concerts are sponsored by CrabIslandOnline.com. All children under the age of 18 must be accompanied by an adult. 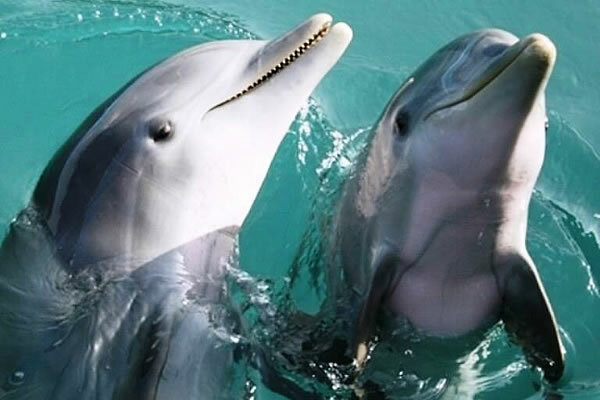 All minors must be accompanied at all times by their parent or guarding in and out of the water. If you choose to enter the water, it is at your own risk and by doing so, you take full responsibility for your own safety. We ask that you do not venture far from the boat to avoid the risk of getting lost. 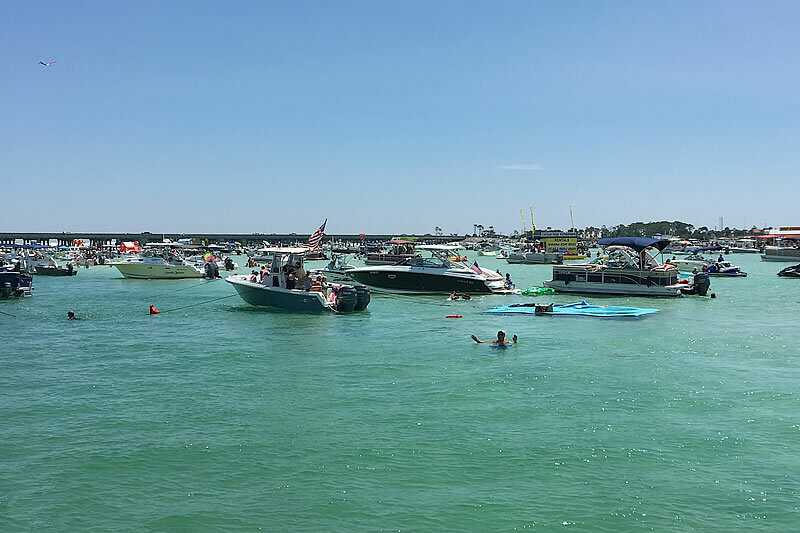 When it is time to head back to the dock from Crab Island, you must be on board the SunVenture 30 minutes prior to the end of the scheduled cruise time. Unfortunately, we must leave at the exact time and cannot wait on anyone. If bad weather approaches, we may return to the dock early. No smoking while aboard the SunVenture. You will be on a boat so there is a chance you may get wet. Plan accordingly. Bring your Crab Island cruise confirmation printed out or ready on your mobile phone. Make sure to wear your swimsuit to enjoy relaxing and playing in the waist-deep waters. Sunscreen is recommended. Floats must be deflated when you bring them on board. Drinks and snacks are available for purchase (cash only). Personal, small coolers & bags permitted. They must be stored under your seat. 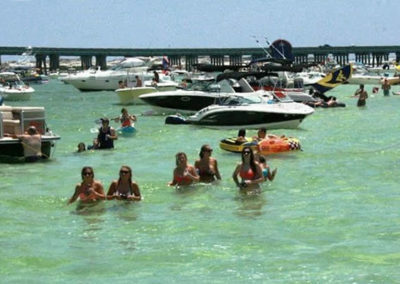 Alcohol is no longer sold at Crab Island, but we do permit you to BYOB (no glass.) The consumption of alcohol must be done responsibly. Underage drinking is strictly prohibited. Any abuse of this policy could result in having the police called. Hats and other items may be blown away, please be sure to secure these items during the cruise. We do not take responsibility for any lost, stolen or damaged items brought on board.